Congratulation to Chris Watson for his 203 game and a 472 series, shot in the Magic Men's league at Bowlero San Marcos. Outstanding job. But now your 121 average is history. Congratulation to Rick Riggin for his 300, shot in the Justin Phillips 410 Scratch Doubles league at Leatherneck Lanes. Woo Hoo!!! FINALLY !!! Those who bowl (or want to bowl) at Leatherneck Lanes are now able to get a 1 YEAR pass!!! The process is still the same and they still require the same information. However, by using the bowling center as the sponsor, they can request the 1 year for you. Contact Leatherneck Lanes (760 725-6109) for more information. Just a reminder. For those intending to bowl the Adult/Youth Twosome tournament at Leatherneck Lanes on April 6th, please be sure to get your visitor pass NOW!. Don't wait. Failing that, please contact David Schaffer for more information. Congratulation to Matt Heyer for his 300, shot in the Vegas Friends league at Leatherneck Lanes. Woo Hoo. The wait is over. The entry form for the Association Championship is UP! 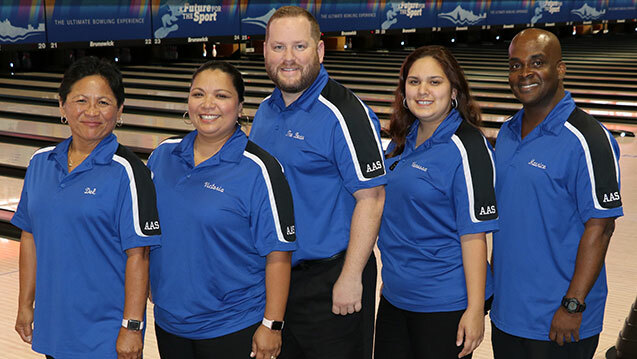 The USBC is going to adjust the squad schedules for the 2020 USBC Open Championship. The full story can be found here. In another interesting piece of news, it seems that ONCE AGAIN, bowling will miss the cut for inclusion in the 2024 Paris Olympic games. The organizing committee for the Paris 2024 Summer Olympic Games has instead announced that they will recommend breakdancing, surfing, skateboarding and sport climbing as the four sports they will recommend to the International Olympic Committee for inclusion in the 2024 Games. SERIOUSLY? Sport climbing has a larger participation and interest base than bowling? At any rate, the full story is here. Results of the Adult Royal Finals are up. Still waiting on the overall results, financials, and the Youth. I've added a few more Honor Scores that I have become aware of. Congratulations to Danny Sustaita & Randy Veach for their 300's at Surf last Wednesday. Congratulations to Kyle Andrews & Lloyd Burleson for their 300's in the Adult Royal Masters. There is a new twist on a phone phishing scam that is going around. Basically, it is a robotic call that says it is from your wireless provider and that your account has been suspended. So... in the interest of keeping our bowlers informed, the link to the full story is here. It will give you the scoop on how the scammers are trying to steal your information, and ultimately your money. As usual, the bottom line is: If you do NOT recognize the phone number... DO NOT ANSWER THE CALL. Let it go to voice mail. And if you do take the call.... Just because you are talking to a real person does NOT meant that they work for that company. DO NOT GIVE OUT ANY PERSONAL INFORMATION OVER THE PHONE. A real company WILL NOT request it in this manner. I really do not like posting these types of things on our site. However, knowing that some of our members have been taken in, I feel it is better to be forewarned and forearmed. Ok sports fans, the USBC has published the proposed legislative items that will be voted upon at the USBC Convention (Apr 29 - May 2). There are 3 league rules (LR), 1 tournament rule (TR), and 4 Bylaws (B) being proposed. The decision on whether to adopt or reject these proposals is determined by the vote of all the delegates attending the convention. The delegates you elected to represent the members of this Association at this years convention are David Schaffer, Nancy Arvanitis, Nick Barnett, and Steve Johnson. It is VERY IMPORTANT that your representatives hear from YOU, the members, as to how you would like us to vote on these items. While the USBC provides a "Recommendation" of how to vote, at the end of each proposal, IT IS NOT MANDATORY, or BINDING upon the delegates. So... without further delay, the following link with show you what is on the USBC plate for this convention. Please click here. After you've enjoyed the reading, please send your delegates an email telling them how you believe EACH proposal should decided. Accept or Reject. Official results of the Feb 2nd 500/600 Clubs Vegas Potpourri tournament are up. I have added a few more pictures of our Hall of Fame members. Thank you so VERY much to Diane Veach for the pictures. If anyone else happens to have any pictures of our Hall of Fame members, PLEASE send me a copy. Congratulaitons are in order. Six months after having knee surgery, Mr. Bruce Pederson is officially BACK! Bowling in the Senior Retired Division of the World Military Bowling Championships (Jan 21-25) in Las Vegas, he is now the proud owner of an IRS form 1099 for next years taxes. With games of 210, 234, 269 & 279 (248 average) in the Singles event, he placed 2nd out of 540 participants. He also finished in 2nd place in Individual All Events (542 participants), averaging 231 for the tournament. In the doubles event, he and Steve Johnson finished in 16thplace out of 271 teams. They finished in 7th place in the Team event and 5thplace in the Team All Events. UN- Official results of the San Diego County Senior Doubles Bowling Club are here. Results of the 500 Club's Singles Tournament are up. Nice to see Keith Genovesee pulling in a few bucks once again. Results of the 600 Club's Certified Singles Tournament are up. Ok. I've changed things AGAIN! If you find anything that doesn't work..... Please send me an email and let me know. Thank you. OFFICIAL results for the November 17th BVL tournament are here. Congratulations to ALL the winners. Good luck at the State tournament. Here is GREAT news. 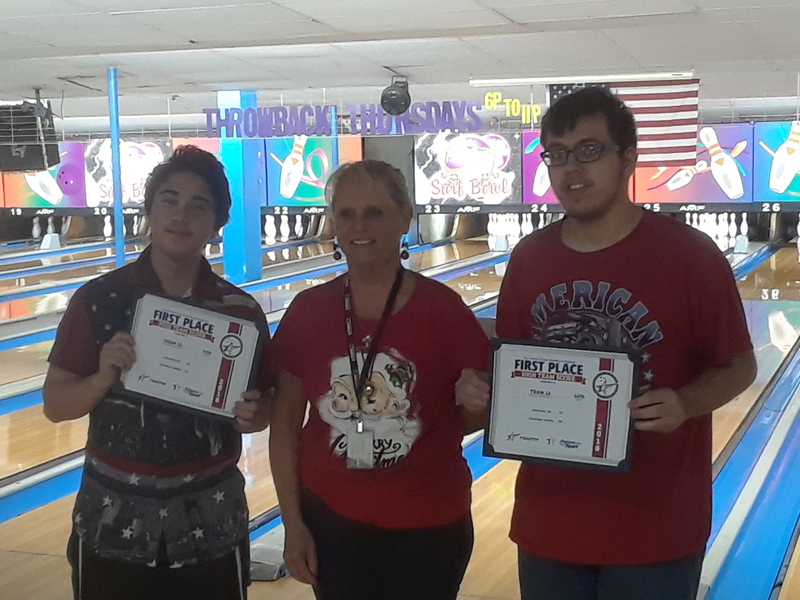 Youth bowlers Glen Teal and C. J. Schaffer received their certification as the USBC's TOP Youth Doubles Team for the 2017-2018 season. Glen bowled a 718 and CJ bowled 758 for a combined 1476 scratch total. Tops in the USBC. Well done gentlemen. Very well done. Official results for the Annual Doubles tournament are now up. It was a great turnout for the celebration of life for Tina Griffin on Sunday. Thank you to all the Family, and Friends!!! Great food and great memories were shared by all. The 200/500/600 Club Dec 1th Christmas Friendship tournament results are here. Congratulations to Jennifer Talbot. Congratulations to Kennison Andrews for his 300 at the BVL tournament. The October 27th Avocado 600 Club Annual Open tournament results are here. Congratulations to Matt Heyer & Elizabeth Counts. Congratulations to Joe Cipollini who rolled a 300 in the Vegas Friends league at Leatherneck Lanes. Nice job Joe. UN-Official results for the October 30th Senior Doubles Bowling Club tournament in Las Vegas are here. Check the Club's web page for the UN-Official Men's and Women's No Tap results. The Eagles have departed to their new home. Members of Team Beav have escorted them to their new permanent homes where I am sure they will be dearly loved and cared for. Thank you to all of you who were able to be there for the presentation. Again, CONGRATULATIONS to Del Hagen, Victoria Beaver, Leonard Beaver, Vanessa Beaver and Maurice Anderson - 2018 USBC Open Championships Classified Division Team CHAMPIONS! 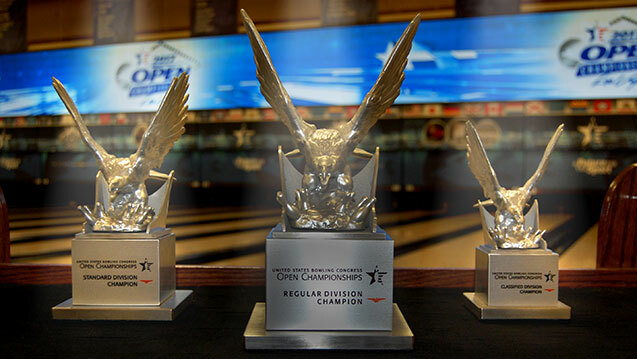 And now that many of you know what an Eagle is, given that the 2019 USBC Open Championship tournament will be in Las Vegas (read CLOSE TO HOME) running from March 9th - June 29th, for those that have never bowled in the Open Championship (OC) you SHOULD get a team together and give that experience a chance. Who knows, you too could win an Eagle. Provided you can beat Team Beav. Official results for the October 7th Avocado 600 Club's Friendship tournament are here. Congratulations to Ladine Jones. Bowling on the same team (Bowlers Depot SM) in the number 2 and 3 spots, in the Magic Men's league at Bowlero - San Marcos, Andrew McCluskey and Howard Stiles both shot 300 in the 1st game (Look). Congratulations gentlemen! 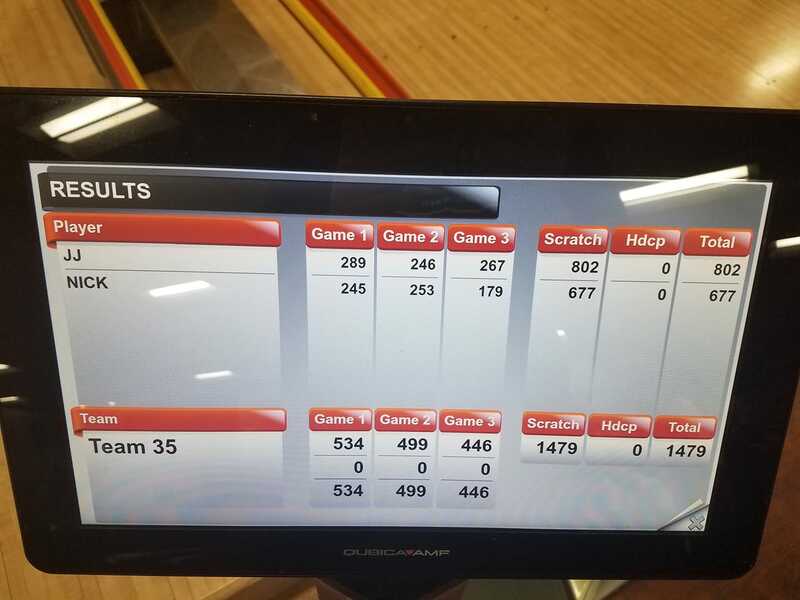 Needless to say, this certainly helped their team with a 1247 scratch game total. Congratulations to JJ Philips. He appropriatly shot his 1st 800 in the Justin Phillips 410 scratch league at Leatherneck Lanes (here). Well done JJ. I am sure your dad is smiling. The new season is well underway at all of our centers. And all centers have an incredible lineup of league choices available. Links to all the centers are available on the left. Check them out. Get a friend to join you and have even more fun. There was an INCREDIBLE turnout and show of support for the family of Justin Phillips Sr. Thank you to everyone for showing up. Thank you to everone who donated their time, efforts, food, gift certificates, coaching time, etc. Thank you to Dawn, Adella, Andy, Monty and everyone else. And of course thank you to the Phillips family for being there at such a difficult time in their lives. Our sincere condolences to the Phillips family, our thoughts and prayers are with you. My apologies for not being able to remember the names of everyone involved in making this something that Justin would be proud of. Official results for the September 15th Senior Doubles tournament are here.